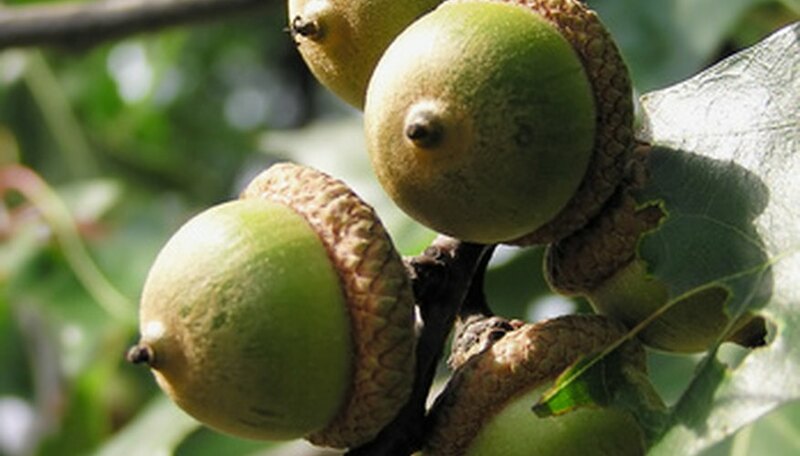 Several popular varieties of oak trees are native to and still thrive in China. One of these species, the cork oak, was cultivated commercially in Asia and Europe to produce bottle stoppers and other cork products. Other species of oak native to China have been imported and grown successfully in North America. Quercus acutissima, or the sawtooth oak, is a large deciduous tree that is native to many parts of China. The sawtooth oak can grow up to 50 feet tall and spread more than 50 feet horizontally. Although not a native tree, sawtooth oaks can grow in North American climate zones 5b through 9a. Young trees require pruning to create classic oak structures. The sawtooth oak requires full sun and does well in many types of soil. It is tolerant of salty soils and drought. The leaves of a sawtooth oak, a tree that has a rounded appearance, are oblong and without lobes. The tree's clean, glossy leaves taper to a fine point. Quercus dentata, or the Daimyo oak, is another oak native to China and other parts of Asia. This tree grows very tall, often between 50 and 60 feet. The Daimyo oak requires soil that drains very well and needs full sun to thrive. Although not native to North America, this tree will grow well in climate zones 6 through 8. This tree has unusually large leaves that can measure 10 inches long with between four and nine lobes. Quercus variablis, often known as Chinese cork oak, Asian cork oak or Oriental cork oak, is native to many parts of Asia, including China. Chinese cork oak is closely related to European cork oak, both of which produce the type of bark used in cork for things such as bottle stops and bulletin boards. Cork oaks, although not native to North America, are good trees for streetside medians because of their resistance to salt and other common road maintenance chemicals. The Chinese cork oak can grow to 50 feet tall. It does best in full sun and in soil that drains well. The leaves of this tree can vary from 3 to 8 inches long.